ANKARA – It is a true honor to appear before the Turkish Parliament, which made history in the past and continues to make the history of the future, President Shimon Peres said Tuesday afternoon in a historic speech. 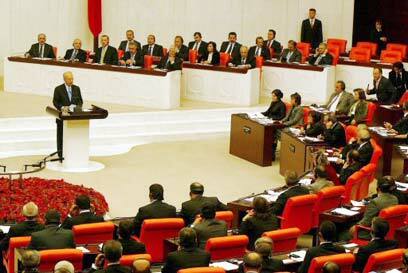 Peres was the first Israeli leader to speak before the Turkish Parliament, and his speech was delivered in Hebrew. The president began his speech with a quote by Mustafa Kemal Atatürk, founder of the Turkish Republic and its first president, and complimented the Turkish culture. "Turkey creates trust. Iran creates fear," he said. "I have come here to listen, not only to speak. To exchange ideas in order to advance the effort to reach a peace agreement between us and the Palestinians, and to look into the chances for peace in the entire region, from Syria to Yemen." Peres went on to say that Turkey was capable of contributing to "the release of the Gaza Strip from the horrors of terrorism, the firing of missiles, and the return of the Israeli captives, and allowing 1.5 million Palestinians to live a normal life. "If the missiles are dismantled and the captives are returned, Gaza and its neighbors will leave in a state of calm." The president explained to the parliament members that Israel was interested in bringing the conflict to an end, and respected the Palestinian people and their leader, Mahmoud Abbas, whom he referred to as "a great personality". He stressed that the diplomatic horizon will lead to the establishment of a democratic, independent and prosperous Palestinian state. "Alongside the democratic Israel we will be able to put an end to the hatred and terrorism which are hurting us all," he said. Addressing the upcoming US-sponsored Mideast peace conference, the president said that "this is a historic opportunity which must not turn into a historic failure", and complimented Turkey on its part in the conference. See all talkbacks "Peres in Turkey: I am here to advance peace"